The below artworks are the most important by Edward Steichen - that both overview the major creative periods, and highlight the greatest achievements by the artist. Artwork description & Analysis: Steichen took several photographs of the virtuoso French sculptor Auguste Rodin. He also made prints of his sculptures and exhibited many of Rodin's sketches and drawings at the 291 Gallery in New York. The two men had become close friends whilst Steichen was living in Montparnasse at the very beginning of the twentieth century. Indeed, Rodin was to become godfather to Steichen's daughter Katherine whose middle name Rodina was chosen in tribute to the sculptor. In this photograph, Rodin is in profile at the left-hand side of the image, mirroring (on the right of the frame) the profile of possibly his most iconic sculpture, Le Penseur (The Thinker). In the background is another of Rodin's famous works, his Monument to Victor Hugo, a writer whose work the Frenchman greatly admired. (The monument to Hugo is here only rendered in plaster and was not cast in bronze until after Rodin's death.) Both works connect Rodin with the intellectual virtues of art, philosophy and literature and Steichen's aim was to associate himself with these qualities too. By photographing a Modern artist and with two of his artworks, Steichen invokes a sort of four-way conversation (between Rodin, the Thinker, Hugo, and Steichen himself) that places photography, still in its infancy in 1900, as a legitimate tool to expand the dialogue of modernism. Artwork description & Analysis: In his early career Steichen combined painting and photography and one can begin to see here how his painting informed on his photographic work. In Landscape with Avenue of Trees, Steichen clearly shows the influence of Tonalism, an artistic movement that began with the painter James McNeill Whistler in the 1870s. Whistler, who was an acknowledged influence on the young Steichen, was interested in composing his paintings in a way that echoed the composition of musical pieces, but by using color rather than notes. Through this tight compositional structure and focus, Tonalists explored the subtle nuances of color and its possibilities for expressing a given mood (much like music). This painting shows Steichen's skill in communicating the nuances of expression through a muted color palette. The work almost verges into abstraction through its interplay of dark and light. Though the title alerts us to the "avenue of trees", the shapes in the foreground are not necessarily very easy to make out, and the landscape itself is only faintly depicted. The moon peeks out from just behind the foliage of the tall tree, casting a glow around the edge of its shape and causing an almost ripple effect of light across the sky itself. It is an image that demands our concentration, Steichen is encouraging his viewer to look (and look again) in order to determine the distinctions in color, shape and line. 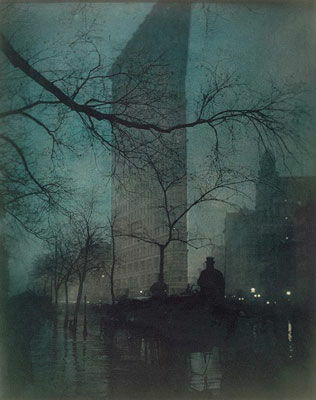 Artwork description & Analysis: Steichen's interest in the interrelationship between photography and Tonalist painting is evident in his famous images of the Flatiron Building. Located at 175 Fifth Avenue in Manhattan, the Flatiron building was one of the tallest in the world upon its completion in 1902, and was truly unique due to its shape. This image was first seen publicly at the "International Exhibition of Pictorial Photography" held in Buffalo, New York in 1910. It was in fact one of six hundred images selected by Alfred Stieglitz as a means of showcasing the artistry of Pictorialist photography. Steichen's photograph, which highlights his feel for shapes and textures, became one of his most famous images and it is easy to see a relationship here with his painting Landscape with Avenue of Trees. The building of the title looms disconcertingly in the background, a large shadow in the centre of the frame. Steichen omits the tip of the building, as if, perhaps, its sheer scale could not be contained by the frame. This image was produced at the height of Steichen's Pictorialist period with the Photo-Secession group. At this time he was interested in adapting and manipulating his photographs and here he colorized the image using layers of pigment in a light-sensitive solution. The image actually exists in three versions, each with a slightly different tone and feel, demonstrating how powerful color can be in altering mood. With this print, his aim was to capture something of the nuances of light in the early hours of the evening. As Professor William Sharpe observed: "Night is a time of dreaming, of freeing repressed libidinal energies, and photographs such as this subtly exploit the suggestive properties of urban landscape, using a symbolic language to disclose truths [that would be] hidden at midday." Artwork description & Analysis: This image was taken in Mamaroneck, New York, when Steichen was visiting his friend, the art critic Charles Caffin. It depicts the moon rising behind a clearing of trees, and then reflected onto a completely still pond. Like Flatiron, Moonlight: The Pond uses light and shadow in an extraordinarily evocative and haunting way. 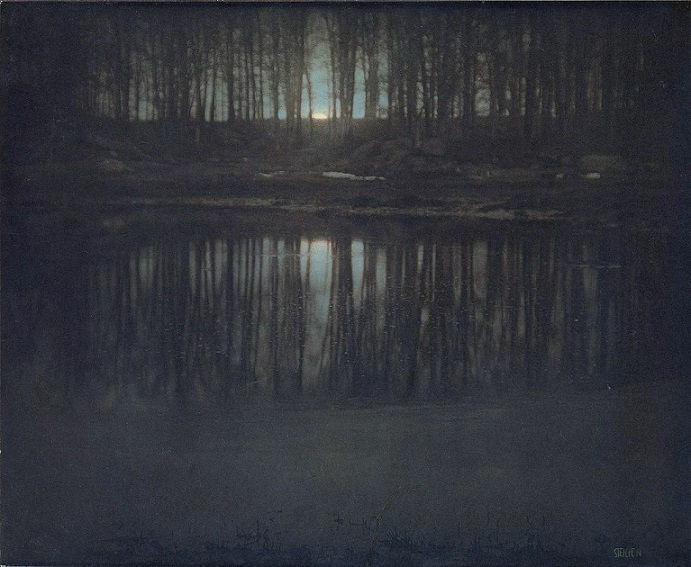 Steichen demonstrates here once more his interest in Tonalism. His landscape is "washed" in a color tone to form a finished mist-like effect. The interplay of light and dark, and the broad dark washes laying across Steichen's palette, were then fully in keeping with the pictorial preferences of the Photo-Secession group. Though the image might appear to be quite simple, it is in fact a complex emotional composition in the way it manipulates its light sources. The moon peaks above the horizon and glows brightly through the trees; its center-frame positioning, meanwhile, suggesting a precise and studied compositional set up. 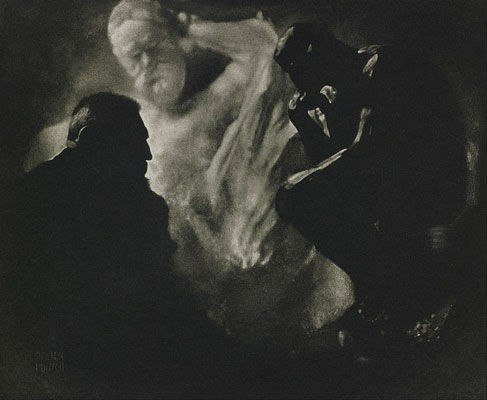 Responding to this image in Camera Work, Caffin confirmed Steichen's credentials as a bone-fide photographic artist through this rather poetic reading: "It is in the penumbra, between the clear visibility of things and their total extinction into darkness, when the concreteness of appearances becomes merged in half-realised, half-baffled vision, that spirit seems to disengage itself from matter to envelop it with a mystery of soul-suggestion." 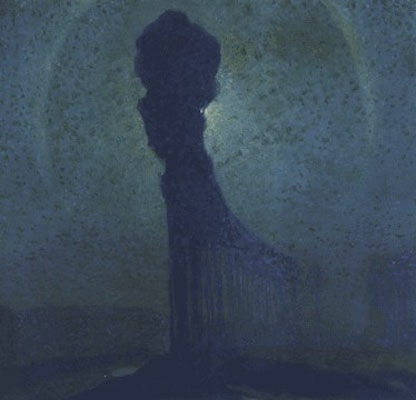 Artwork description & Analysis: In this astonishing image, made after he abandoned his interest in Tonalism, Steichen captures an otherworldly energy in the movement of Thérèse Duncan, the adopted daughter of the renowned dancer Isadora Duncan. Steichen met Isadora when she was in Venice with her dance troupe. He then followed her to Greece in the hope of being able to photograph her dancing on the Acropolis. In the end, however, it was Thérèse and not Isadora that he photographed on the rocks above the citadel. The image was first published in Vanity Fair in 1923 accompanied with a caption by the poet Carl Sandburg (Steichen's brother-in-law) which read: "Goat girl caught in the brambles . . . let it all burn in this wind fire, let the fire have it..."
In the photograph, the exuberant Thérèse has contorted her body; her knee is cocked, and her arms are cradled over her head in an almost Classical female pose. She stands on uneven rock with some leaves of wild-plants in the foreground, but it is her billowing dress that grabs our attention. The translucent material both hides and reveals her body. Thérèse appears to us as almost naked in fact. Steichen said the following about the image: "She was a living reincarnation of a Greek nymph [...] The wind pressed the garments tight to her body, and the ends were left flapping and fluttering. They actually crackled. This gave the effect of fire." Steichen has managed to capture a timeless image here in the way the modern and the classical meet. Artwork description & Analysis: This portrait of silent movie star Gloria Swanson is one of Steichen's most celebrated works. It merges the worlds of portraiture and fashion photography to spellbinding effect. The image was later published in the February 1928 issue of Vanity Fair to help publicize Swanson's new film Sadie Thompson. 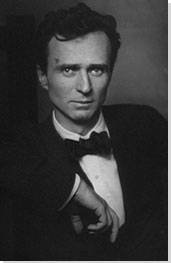 Journalist, critic and editor of Vanity Fair Frank Crowinshield referred to Steichen as the "world's greatest living portrait photographer" and in this portrait one can appreciate his point. The most striking element of the picture are the Star's hypnotic eyes that look directly into ours. Given that they had no voice, it was the norm for silent film stars to convey their screen presence through their eyes. Indeed, Swanson was widely recognized for her wide-eyed look and by emphasising them in this image, Steichen acknowledged her intelligence and her skill as a performer. In this way, the portrait celebrates both her standing as an artist and her qualities as an individual. Steichen wrote about the photography session in his autobiography: "At the end of the session, I took a piece of black lace veil and hung it in front of her face. She recognized the idea at once. Her eyes dilated, and her look was that of a leopardess lurking behind leafy shrubbery, watching her prey. You don't have to explain things to a dynamic and intelligent personality like Miss Swanson. Her mind works swiftly and intuitively." In this description, Steichen acknowledged that if one is to strive for the very best portraiture, then there must first be a true affiliation between sitter and artist. Artwork description & Analysis: During the first half of the twentieth century, New York came into its own. There was considerable public fascination with skyscrapers and demand for architectural photography and magazine features was high. Steichen was thus commissioned by Vanity Fair to photograph the Empire State Building, at that time the world's tallest building, and arguably the modern world's greatest architectural achievement. Faced with the problem of capturing the true majesty of this iconic landmark, Steichen prepared for his assignment with the same thoughtfulness with which he approached his portraiture. In order to capture the building's true stature, Steichen devised a strategy whereby he photographed the building frontally and cater-cornered before then superimposing one negative on top of the other. The end effect, in which Steichen renders the building's power in three dimensions, is astounding. As for the images title, Steichen said "I conceived the building as a Maypole...to suggest the swirl of a Maypole dance" (a city centrepiece, indeed, around which the proud denizens of New York might come to rejoice). 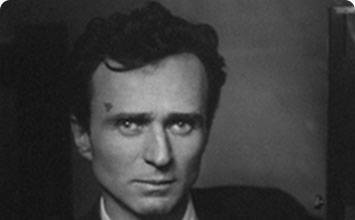 In 1951, MoMA initiated an "Art Lending Service" which operated into the early eighties. The lending service was devised by the museum's Junior Council to encourage art collecting amongst its members and/or the general public. Selected works were available for rent for three months at a time, after which, the patron was free to buy or return the work to the museum. The Maypole was one of the most popular images to pass through the "Art Lending Service". According to MoMA's own publicity, The Maypole's popularity was "testament [to] the technological advancements in architecture as much as in photography, and [to] the iconic legacy of one of the sharpest eyes to have captured both." First published on 22 Dec 2018. Updated and modified regularly.